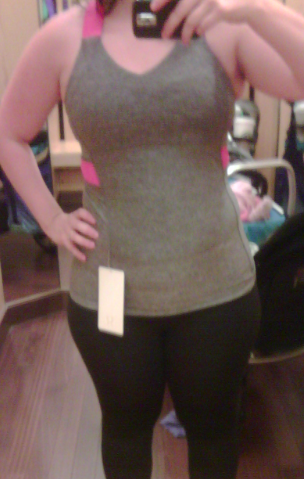 Tried on these Push Your Limit Tanks in Senorita Pink and Static Grey, Lolo and Power Purple and River Rock and Static (I think it was a static). These are a size 6 so too small for me. I also had a freaking out baby so I couldn’t make adjustments to straiten the top and pull down the shelf bra properly so it looks a bit lumpy. I also have a Flow Y underneath so you can imagine how tough it was getting these on and off. Anyways, I didn’t get one because the one I most love is the Citron one. That is a killer color on this tank. I also don’t exactly need a new running tanks so I’m holding off getting the citron until the size 6 fits better than this. Of these three new ones I found the Lolo to be the most flattering on but the Senorita was the most comfortable because it was the static. Now that I think of it…aren’t these made of Luxtreme?? SO would it have been a static if it was luxtreme?? I don’t know. In any event, the grey looked shiny and felt soft so it may or may not have been luxtreme. hi! what size do u take in ur push ur limits tanks? do u take the same size as your power Ys and CRBs? No they were at Coquitlam. Now that I think back I think there was a River Rock one all one color that I forgot to grab. Shoot. I think I really liked that one too. Maybe I imagined it. Anon 6:37 I believe it was all Lolo except for the straps and a stripe of power purple in the sides/back. Anon 8:35 I would stay the same size as your power y and CRB's mostly because of the support you get in the shelf bra. 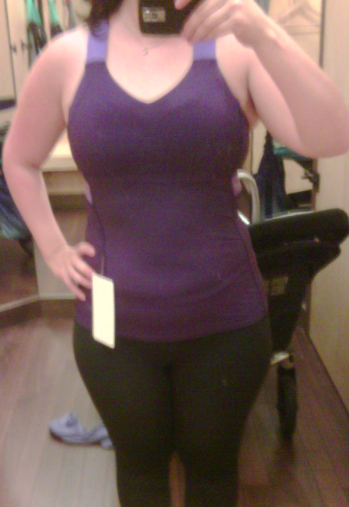 if you sized up you would get a looser fit around the middle but the shelf bra may be too big. If you layer a bra under it than you can probably go up a size if you wanted to. 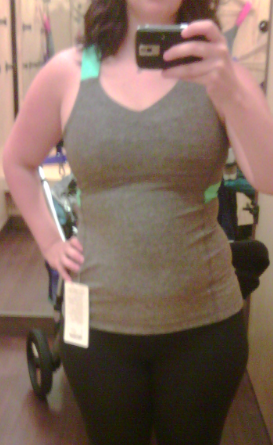 If I were getting this tank for right now I would have gone with an 8 (TTS) and not the 6.
so this is really supportive enough to run in? i'll have to check one out (and jump up and down a few times) if they have it at my local showroom. Yes I found it supportive enough. It's more supportive than the Flow Y bras, probably along the lines of the 50rep bra.